What is the IFNA Function in Excel? 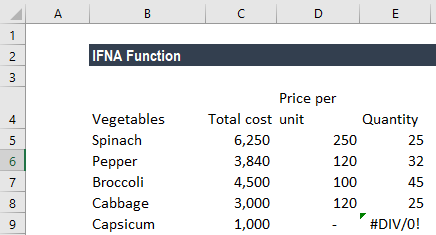 The IFNA function in Excel returns an alternate value as specified by the user if a formula results in an #N/A error. It is a Logical functionFunctionsList of the most important Excel functions for financial analysts. This cheat sheet covers 100s of functions that are critical to know as an Excel analyst that was introduced in MS Excel 2013. The purpose of the IFNA function is to use an alternate value instead of the #N/A error. Value (required argument) – It is the formula or expression to be checked for an #N/A error. Value_if_na (required argument) – It provides the specified value if the result of the formula or expression is N/A error. How to use the IFNA Function in Excel? Using the value in A3 and #N/A in A4, let’s see how to apply IFNA to get rid of #N/A. Now we need to find out the price of Pepper and Banana from this information. If we just use the VLOOKUP formula, the result will be #N/A for Banana. Here, IFNA function tested the results of VLOOKUP function. VLOOKUP returned the #N/A error value as it couldn’t find Banana in the given lookup range. However, IFNA returned the value 0 in the cell instead of the standard #N/A error value. On a similar basis, we can use the HLOOKUP formula combined with IFNA. As the IFNA function is more specific and targets only specific error, which is #N/A, it is more appropriate to use than IFERROR function in certain circumstances. All other errors, such as #DIV/0! or #REF!, are ignored by the IFNA function. IFERROR, on the other hand, would trap other errors too. The user made a typo error by putting 0 for the price per unit of capsicum. Now, when he wishes to derive the quantity for each vegetable, he would get a #DIV/0! error for the quantity of capsicum. Let’s see how the results would be different under IFNA function and IFERROR function. When we use IFERROR formula as shown below, the result would be 0, as IFERROR considers all errors. 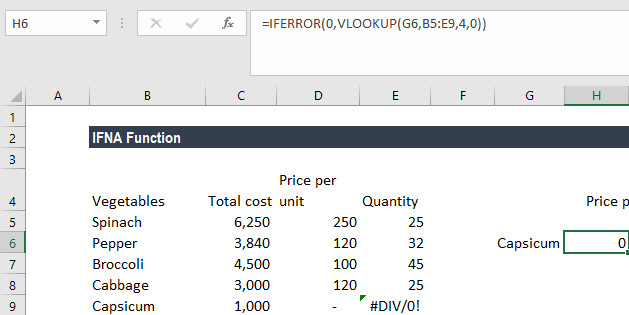 Since the quantity is calculated by dividing the total price by price per unit, MS Excel would display the #DIV/0! error for vegetables whose prices were (erroneously) typed as 0 per unit. This is a kind of error that we will handle in a different manner, compared to the way we will handle the #N/A error. However, IFERROR considered it as an error and returned 0 for it. On the other hand, IFNA would return #DIV/0! error as it considers only the #N/A error. So, IFNA becomes handy when you are only looking for the #N/A error only. The function becomes useful when we are handling extensive and complicated data sets where the user would miss different type of errors on the sheet. The IFNA function helps to trap error functions and is very useful when handling large amounts of data. Remember that if the user provides value_if_na as an empty cell, the function would treat it as an empty string value (“”). It is quicker when comes to troubleshooting, as it is more specific compared to IFERROR, ISERROR, ISERR, etc.